Lourdes: Pilgrimage And Healing - This is an excellent portrait for those who would like to know more about Lourdes, and it provides viewers a wonderful opportunity for deeper understanding of pilgrimage. Lourdes: Pilgrimage And Healing - Lourdes is the most famous of all shrines to the Virgin Mary. Every year it attracts thousands of pilgrims. But Lourdes is not only about spectacular "miracles." Its central theme is that of inner healing. Lourdes is about physical and spiritual healing, recollection, prayer and inner peace. 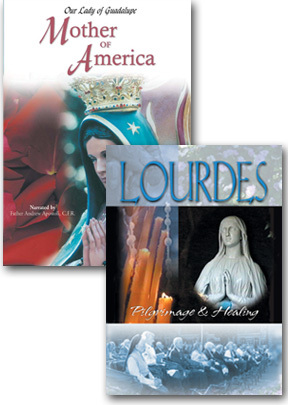 The program captures the daily spiritual rhythm of Lourdes - the Procession with the Blessed Sacrament, the Way of the Cross and the torchlight procession. There are interviews with pilgrims which give witness to the deep spiritual meaning of the experience of Lourdes. This is an excellent portrait for those who would like to know more about Lourdes, and it provides viewers a wonderful opportunity for deeper understanding of pilgrimage. Our Lady Of Guadalupe: Mother Of America - In our personal longings for the fullness of life, often a mysterious cry for maternal love springs from the human heart. Is it possible that a spiritual mother could allay the tears and fears of the people of the third millennium? Our Lady of Guadalupe, Mother of America explores the significance of the Blessed Mother's appearances to St. Juan Diego. This documentary proposes that Our Lady of Guadalupe is the answer for all Americans who are seeking peace, the good things in life and even eternal life. In Our Lady of Guadalupe, Mother of America, you'll experience the feast day of Mary in Mexico City: exuberant Aztec song and dance, mariachis, contemporary music, heartfelt interviews and insightful words from Church leaders. You'll see the creation of an exquisite work of art: a nine-foot statue of Our Lady of Guadalupe that is the focal point of a new shrine in the United States. And you'll witness how Our Lady of Guadalupe is touching many hearts beyond the borders of Mexico. Our Lady of Guadalupe, Mother of America is convincing evidence of the necessity of the Mother of God within the Christian faith. Throughout Church history, the Virgin Mary has appeared during humanity's most crucial times. Today, as mankind faces a cataclysmic battle between good and evil, she has come to guide us on the path to salvation.